2. plug and play of Ethernet switches. 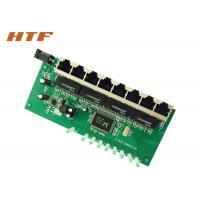 The HT-S1008HX is a 10/100M Fast Ethernet switch provides 8 Auto-Negotiation RJ45 ports. All ports support Auto MDI / MDIX function and each port can be used as general ports or Uplink port, is a simple configuration, plug and play of Ethernet switches. is a specifically designed for the home network cabling, and can provide for multiple home computers to share information, is cost-effective network product, widely used home,hotel,commercial and other multimedia cabling box, and the network data Transmission, cabling distance extend and other. 3. Each ports supporting Auto-MDI/MDIX. 5. Supports Full Duplex flow control mode and backpressure for half-duplex mode. 6. Supports MAC address auto-learning and auto-aging. 8. LED indicators for monitoring power, link, activity.